Securing mobile devices access to an on-premises Exchange Server infrastructure without a hybrid setup is not complicated when using a single-vendor strategy. You simply implement a Mobile Device Management Solution and you are done. Enterprises doing business in the high security industry tend to follow a multi-vendor strategy to reduce the risks due to security flaws in third-party devices. This post on the business requirement to authenticate mobile devices and authorize user access to on-premises Exchange Server mailboxes using a multi-vendor strategy. 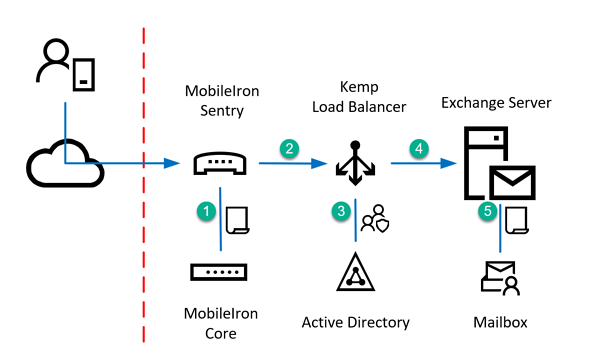 The solution consists of a MobileIron Sentry implementation and additional Kemp LoadMaster VLM devices located in an internal network segment. The Kemp LoadMaster Edge Security Pack (ESP) functionality is used to allow ActiveSync connections for members of a dedicated Active Directory security group only. The following screenshots illustrate a working setup for a virtual service load balancing mobile device connections from MobileIron Sentry to Exchange Server. I assume that you've already configured the Single-Sign-On (SSO) Domain settings for connecting to a domain controller to authenticate users. 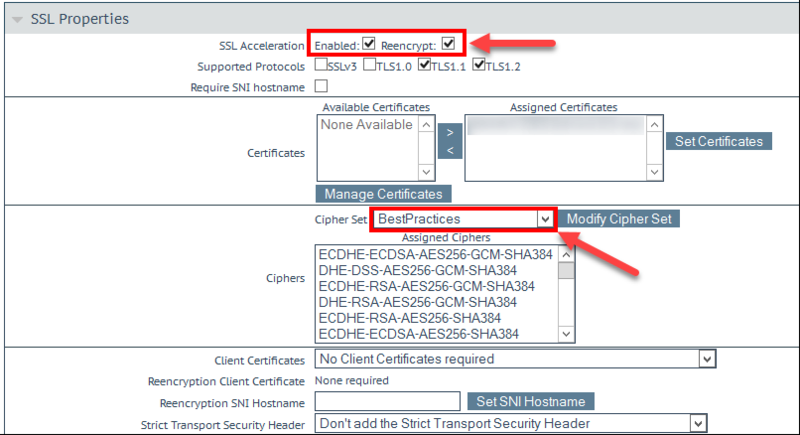 The SSL Traffic is offloaded and re-encrypted, because the LoadMaster needs to authenticate the user using the ESP feature. Therefore, you must ensure to select a Cipher Set that does not provide any weak or unsecure cipher suites. In this example I've selected the predefined set named BestPractices. Select the TLS protocol version depending on the compatibility level of the mobile devices used. Ensure to click Modify Cipher Set to save the changes of the selected set of ciphers. Changes made to the checkbox selection do not need to be saved separately. Do not forget to click the Set button where available. In the Real Servers section, you add all member servers of your Exchange Server DAG or any other Exchange Servers serving client access functionality. Ensure to use the HTTPS protocol for health checks and ensure to query the /Microsoft-Server-ActiveSync/healthcheck.htm url. With this Kemp LoadMaster configuration, you've added a Kemp LoadMaster as an additional authentication endpoint to secure mobile device access to Exchange Server mailboxes. This implements a multi-vendor strategy for authorization and authentication of mobile devices and users.